September is the heat of late summer season, and the Kimono world has switch to autumn, a season to wear single garments. 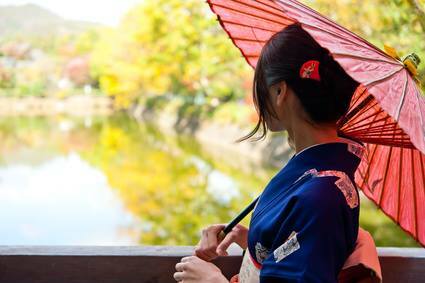 However, it cannot be considered as autumn with the heat of the sun, and it is good to wear thin garments or Yukata robe. It is recommended to “stay ahead of the season”, but recently, there is the thought that has been broiling on being rude to people around. After it has become colder, the yukata robe looks bleak so let’s switch to single garments. Single garments are also for June, so the summer single garments in June will become single garments for autumn in September. And even though it is the same single garment, the one for June is a cool item and the one for September is a warm item. However, since it is a general rule of thumb, it is alright to choose a matching color, or a color matching the moon at that time as a priority. The Obi belt can be the same as the June’s Obi belt or an unlined obi, or it can also be thin line. It is customary for the obi and obi sash is to use the thing for winter unlike in June. The September pattern often uses those with the theme of viewing the moon. Rabbit is a pattern that can be used all year, but when wearing it at this particular period produces a reminiscent “rice cake with the rabbit” season feeling.